Another year is coming to an end, so I suppose I should take a look back at this year, although I might not want to. From a professional standpoint, I didn't do anywhere near as much writing as I would have like to this year. I started several stories, and I even started a new novel, but I only finished two stories. The simple fact is that I don't have enough time to write. At the moment, our financial situation is a bit grim, which means I have to focus more on editing and game design because I see the money from those endeavors more quickly than I do from writing. As an editor, I saw the release of Taurin Tales this year, and I also completed A Robot, a Cyborg, and a Martian Walk into a Space Bar, which will be released in just over two weeks. And from the game design perspective, I wrote a lot of supplements for the Ephemeris RPG. Most of these were written early in the year before I had to go back into the "real" work world. On a personal level, 2014 was mostly a good year. The kids continue to grow and I'm very proud of most of the things they're doing. Marriage is still bliss. I couldn't ask for a better partner to navigate the harshness of reality with. The biggest downer of the year has been our deteriorating financial situation. Alexis had surgery early in the year, and even though she was insured, the bills have been outrageous. We're still paying a little bit each month, and hoping to keep them off of our backs until we get our tax return. We quickly learned that just one of us working wasn't enough to pay our bills, so I had to go back into the "real" work world. Rebecca is still hoping to get promoted at some point in the coming year, but until then, things will be a struggle. Sadly, rent and other bills go up by a much larger percentage than the annual raise she saw...and that's how it always seems to be. This, to me, seems to be the main reason why we're seeing a shrinking of the middle class. Happy New Year, everyone. See you in 2015! At the end of October, I was asked to submit a story for an upcoming anthology. The deadline for the story was Dec. 31st. I just finished the story and sent it off. Needless to say, I cut this one close. This story was a bit of a departure from what I usually write, so I'm not sure how it will go over, but I'm certainly hoping it gets accepted. We wanted to thank everyone for supporting our Kickstarter for A Robot, a Cyborg, and a Martian Walk into a Space Bar. The project was successfully funded, and we are all very grateful for that. Even if you weren't able to help financially, but you reposted our links, we appreciate that as well. Every little bit helps. I'm sure the authors would like to thank you as well, since this means that the book is that much closer to making a profit, which means more money for them. 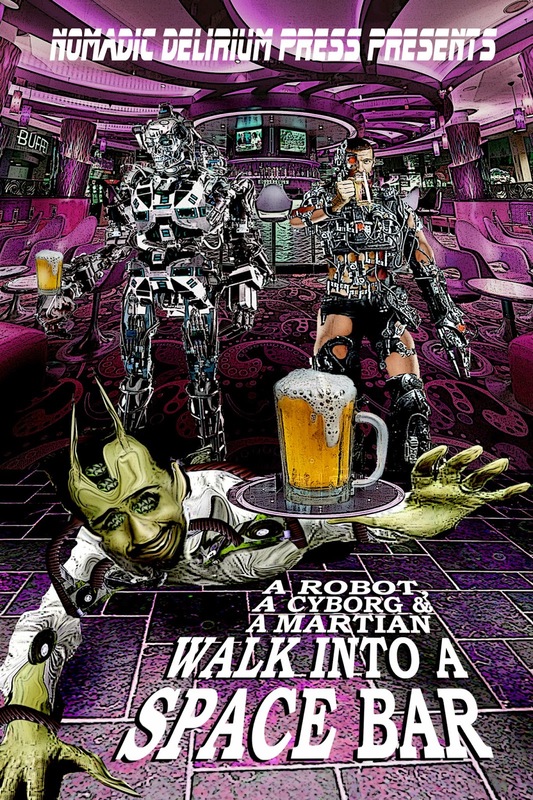 The Kickstarter for A Robot, a Cyborg, and a Martian Walk into a Space Bar ends Sunday night, and we only need an additional $120. This is very doable, so any last minute pledges would be greatly appreciated! Our Kickstarter for A Robot, a Cyborg, and a Martian Walk into a Space Bar has almost come to a close, and we still find ourselves $240 short. If you've given any thought to possibly donating to this Kickstarter, we ask that you now do it. We're offering some really great rewards. The official release date for the book is January 15, 2015. There are only a few days left in our Kickstarter for A Robot, a Cyborg, and a Martian Walk into a Space Bar, and we still need to raise an additional $265. This book is going to be a really fun read, so please help out with whatever you can. There's just one week to go in our Kickstarter for A Robot, a Cyborg, and a Martian Walk into a Space Bar, and we still have a long way to go. Any help you can give us would be greatly appreciated. After the opening ceremonies, I had a signing as part of Author's Alley. I sold some stuff and signed some things, but mostly it was a chance to talk to other authors. Many of them were the usual suspects, while I did get a chance to catch up with a couple of people that I haven't seen in years. Saturday's first panel was about world design in games. We had some RPG people and some video game people, and at first it didn't seem like the mix was working that well, but it did seem to come together, and I think we once again imparted some wisdom upon the SRO crowd. A couple of hours later, I had a panel on Kicsktarters, and I really felt that panel was informative, because I definitely learned some things...things that I will be trying to implement when I do the Kickstarter for A Robot, a Cyborg, and a Martian Walk Into a Space Bar. Watch for details soon. That night we went to the masquerade. Every year before the masquerade they allow kids up on stage that did masks at the mask making table. This year, only two kids went up on stage...my two youngest. Jul had made a rabbit mask, and did a shy rabbit pose. Lex had on a Teenage Mutant Ninja Turtles t-shirt, and a red mask, so she did her best Raphael pose on stage. The masquerade had some great costumes this year, but it seemed much shorter than usual...but it was still a good time. 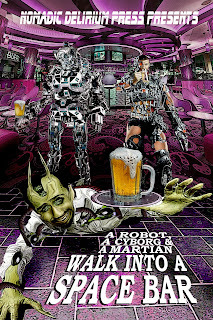 After the masquerade, I managed to track Laura Givens down, and we hashed out the details for the cover of A Robot, a Cyborg, and a Martian Walk Into a Space Bar. I think it will look very cool, and I'm sure Laura will have something for me very soon to share with everyone. On Sunday, I didn't have any panels, which I think is a first, so we took in parts of the Critter Crunch, and then we carved pumpkins with the Pumpkin King. Eventually we ended up at Sci-Fi Name that Tune, and for some reason that I can't even begin to fathom, I volunteered to be one of the players. I have to admit that my geek knowledge is much more specific than most of the fans, so I knew I was going to embarrass myself, but I did any way. Before we started, I said it was my goal to get at least one right. I doubled my goal! After that it was the closing ceremonies, which are always a melancholic event, since it means that the Con is over. If you want a copy of Taurin Tales, make sure you track me down early, because I'm hoping to sell out fast! My new short story collection is now available as an e-book in all the formats you might want to read: https://www.smashwords.com/books/view/486135. More than anything else, science fiction deals with questions that begin, “What if?” You’ll find that distinguished author, editor, and publisher J Alan Erwine asks a lot of those questions in “Where the Fleet of Stars is Anchored.” What if your society requires you to kill 200,000 people? What if a new lobe should sprout in the human brain, and what would it make humans capable of? What if we had to choose between alien life forms? The answers that Erwine provides will keep you thinking about them long after you’ve read this. And that, too, is the purpose of science fiction. The long-awaited release of Taurin Tales has finally arrived. The book is now available in print and as an e-book. Nomadic Delirium Press has released seven new downloadable bundles on their website. Six of these feature things I've written, edited, or are part of the Ephemeris RPG universe. These are some really great deals, and you should check them out at: http://nomadicdeliriumpress.com/blog/shop/. I'll be attending other events, and I will, of course, have copies of Taurin Tales with me everywhere I go, so you can always buy a copy from me...and remember Ian Brazee-Cannon and Laura Givens will also be at the con, so you can get all of us to sign your copies. The exploration of “Unexplored Space” continues with Sectors 28. Sector Twenty-Eight is one of the largest sectors in “Unexplored Space,” although the eleven species have not done much to colonize the sector. There are quite a few dead colonies from ancient species, and some other unexpected mysteries in some of the systems. Most importantly, however, is that this sector is home to the Mosicans, a species that has only recently gained interstellar travel. So far, they’ve only colonized a few sectors, and they’re yet to meet any of the other eleven species, but they certainly will at some point in the future. You will also meet the Taurins, a species that is on the edge of interstellar travel, and is close enough to the original six species that once they achieve interstellar travel, they will quickly meet the original six. Pick up your copy at http://rpg.drivethrustuff.com/product/137992/The-Ephemeris-Encyclopedia-Galactica-Sectors-TwentyEight. My new short story collection, Where the Fleet of Stars is Anchored, is set to be released by Alban Lake Publishing in early October. The e-book version will be available very soon, and the print version will be available later in the month. Of course I'll have purchase links posted as soon as I get them. 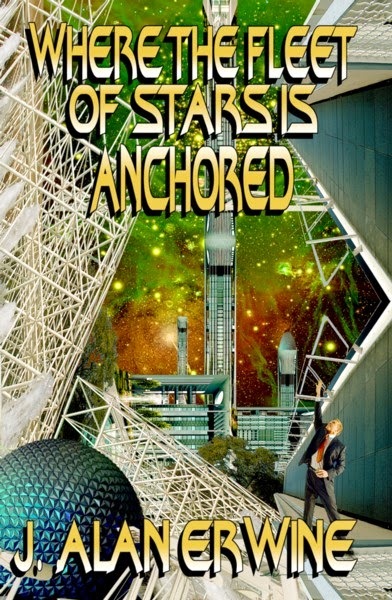 This collection is a group of stories about space exploration, a definite passion of mine. All are previously released stories, but for those of you that have not read all of my work, I think this will be a great addition to your libraries. As soon as I have a cover and order links, I'll be posting them all over the internet. There are just seventeen days left until the release of Taurin Tales, and you can still pre-order it from a number of sites. Things have been beyond crazy busy around here lately. My part time job has been steadily adding hours to the point where I'm now over 30, and I'm sure I'll be hitting full time hours in the weeks to come. It's great for the money (which we desperately need), but it leaves little time for me and Rebecca to see each other...as we're basically working opposite schedules to make sure that one of us is always here with the kids. In addition to all of the work, I'm still trying to keep up with my writing, editing, and game design schedule...although the writing is suffering the most. Taurin Tales has now been delivered to the printers, and I can't wait to see what it will finally look like. I've also finally finished Sector 28 of the Ephemeris Encyclopedia Galactica...the one that has been tripping me up for a while. But considering that it's over 12,000 words, and it introduces two new species to the game (including the Taurins), I think it will be well worth the wait. It should be out early next week. It also took a while because there are so many star systems in this one. Many of the stars that make up the Hyades can be found in this one...and that's a lot of stars. There's just one month to go until the release of Taurin Tales, and the pre-sale is still on. You can order it from us at: http://nomadicdeliriumpress.com/blog/product/taurin-tales/. You can order the e-book version at: https://www.smashwords.com/books/view/472428. You can order the Kindle version at: http://www.amazon.com/dp/B00N8AIN5S. Starting Wednesday, September 10th, Nomadic Delirium Press will be having a ten day sale on almost all of their titles. Many of these were written or edited by me, so this is a great chance to pick up some of my work. The sale will feature both e-books and print books, and each day, a different set of books will be featured. Be sure to check out the sale every day at http://nomadicdeliriumpress.com/blog/shop. The Kindle and Nook versions of Taurin Tales are now available for pre-order. Soon Amazon and Barnes & Noble will also have the print versions as well. If you'd like to order the Kindle version, go to http://www.amazon.com/dp/B00N8AIN5S, and to order the Nook version, go to http://www.barnesandnoble.com/w/taurin-tales-j-alan-erwine/1120310691?ean=2940046140446. The e-book version of Taurin Tales is available for pre-order in a number of formats from Smashwords at https://www.smashwords.com/books/view/472428. You don't even need an e-reader to read it...you can read it right on your computer screen. The print version of Taurin Tales is now available for pre-order, and if you order before the release date, you can get it for $1 off the cover price: http://nomadicdeliriumpress.com/blog/product/taurin-tales/. The pre-release party for Taurin Tales is underway. You can pre-order the print version, the e-book, or the Kindle version by going to http://nomadicdeliriumpress.com/blog/product/taurin-tales/, and following the appropriate links. The list price for the print version will be $10, but if you order it before the release date, your price will be just $9. Other retailers will start to have the book available in the days and weeks to come. When I first created the Taurins for the Taurin Tales anthology I really liked what I had come up with. When I read the stories the authors had come up with for the anthology, I decided that I wanted to do as much as I could with these aliens, which would include a second anthology that I'll start reading for next year. Yesterday I was working on the Ephemeris Encyclopedia Galactica and I came upon the star system that I used for the Taurins' homeworld in the anthology, and I decided that the Taurins were going to be in the Ephemeris RPG. They aren't an interstellar species in the game, but they are an interplanetary species, and that might lead to some interesting games. This sector of the EEG should be out some time in the next couple of weeks. You can now download the September issue of The Fifth Di... Go to https://www.smashwords.com/books/view/467806, and order today. The Fifth Di... features some of the best science fiction and fantasy fiction. In this issue: Robert P. Hansen, Rik Hunik, J. L. Neves, and Fredrick Obermeyer. From Nomadic Delirium Press: The long-awaited, and hopefully much-anticipated release of Taurin Tales will be on October 15th. We will be posting info about the pre-release in the next few weeks. I'm currently in the process of editing the submissions and laying out the format for Taurin Tales. We are shooting for a release date some time in October. In the next week or two, we should have an exact release date, and we should also have information about the pre-sale shortly after that. For months, Nomadic Delirium Press has been releasing two to four editions of the Ephemeris Encyclopedia Galactica every month but now the releases have slowed down. This has prompted some to ask me whether or not there will be more sectors covered in the future. The answer is a most definite yes, although with me working a "real" job now, the releases will be more spread out...and I do have some definite surprises planned for the future of Ephemeris, so please stay tuned. We were already having financial problems, and now we're starting to have problems with our only car. I guess as the saying goes, "When it rains, it pours..."
We're both going to be picking up a few extra hours at work over the next couple of weeks, so that will help, but it's really cutting into our time together, and my work-at-home time. Some day this will all pay off...right?????? I'm slowly turning most of my published stories into individual e-books. Most of the stories will be selling for $0.99, although I will probably make a few of them available for free. The first group has been posted at https://www.smashwords.com/profile/view/jaerwine, and I will continue to post more as I have time. The stories are also available on Kindle. You can just search out my name there...but there will be a lot of titles in addition to my individual short stories that you will have to sift through...but you can always buy those too! We're into the final week of the Taurin Tales Kickstarter, and things are looking bleak. We still have a long way to go, so any help you can give would be greatly appreciated. You can get print copies of the book, even signed print copies. You can get your name adapted for the next issue of Taurin Tales. There are some really great rewards, so if you have a few extra bucks (which I know, most of us don't,) please help. 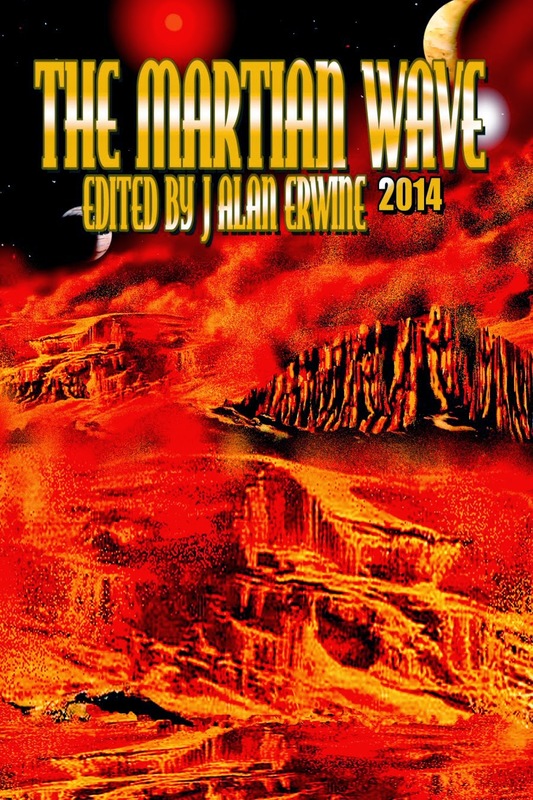 The Martian Wave: 2014 is finally here! The Genre Mall is back! People who have been reading this blog for a while might remember that a quack of a surgeon put me on neurontin a while back to deal with the chronic pain I suffer from. The drug did nothing to help with the pain, but it did leave me with some nasty side effects. I eventually weaned myself off of the crap, and decided to just deal with the pain. One of the side effects that I suffered from was something that I started calling dream attacks. In these dream attacks, I would have one bad dream or nightmare after another, most of them involving the death of a loved one. They would go on an on all night, waking me up over and over again, and leaving me feeling completely exhausted and depressed in the morning. Unfortunately, this is a side effect that has never entirely gone away. I still suffer from these damn things every once in a while. It's a horrible feeling laying in bed for eight hours a night dreaming about nothing other than the death of your loved ones. I've said it before, and I'll say it again, if your doctor is ever considering putting you on this medication, please, please, please give it some serious thought. I would not wish these feelings on anyone. Tonight I start my new part time "real" job. It's definitely going to help having a second income, as we are most definitely struggling financially...still trying to pay the over $1000 we owe for Lex's surgery is just a start. Although the money will be nice, working again will have its challenges. Rebecca and I already have very little time together, and this is going to cut into that to a great degree, as we have to work opposite schedules. I'm certainly going to miss the extra time I've had with her and the kids. It will also be difficult for me to keep up the writing, editing, and game design schedule I've had going, as pretty much every free second I've had has been devoted to that. There are a lot of sales going on in July, and many of my titles have been available at discount, but those sales are almost over, so you're almost out of time. The Genre Mall also has e-books at 10% off, and several of those are mine as well. Go to: http://jalanerwine.com/thegenremall/shop/ and use coupon code "new" at checkout. They all end on the 31st, so order now...and of course, order often!!! There's not much time left to help raise money for Taurin Tales. This is going to be a great collection, and I'd really love to be able to get this out to readers in September. If you'd like to help, you can go to Kickstarter at https://www.kickstarter.com/projects/1521750492/taurin-tales, or you can help out by going to Indiegogo at https://www.indiegogo.com/projects/taurin-tales. Thanks ahead of time for all of your support. The folks at DriveThruRPG and DriveThruFiction are having a Christmas in July sale, and all of the Nomadic Delirium Press titles are 25% off. This is all of our Ephemeris RPG titles and all of our fiction titles. The Genre Mall is back!!! For years, The Genre Mall was one of the best places on the net to find small press speculative fiction titles. It's now back as an outlet for e-book titles. There are currently publications from two publishers up on the site, and I already have five more committed to sending me their works as they have time. For the moment, until the financial situation at Casa de Erwine improves, I'm hosting the mall on my own website, but that will change in the future. If you're a reader, go get yourself an e-book... http://jalanerwine.com/thegenremall/shop/! The exploration of “Unexplored Space” continues with Sectors 26 & 27. You’ll find a few colonies in this tome, but you’ll also find lots of planets waiting to be explored, and planets that were once colonized, but no longer are. There are more machine culture colonies that have been abandoned; some of which may have treasures beyond imagination left on them. Abandoned and destroyed colonies of an ancient culture known as the Glikth are here to be explored. Plus there are the usual mysteries that can be found where no one has been in centuries. My short story, "Sad Grey Eyes on Tharsis" has been reprinted in the new issue of Outposts of Beyond from Alban Lake Publishing. All of our e-books are on sale at Smashwords for 25% off for the entire month of July. Go to https://www.smashwords.com/profile/view/nomadicdelirium and order today. This includes our latest release, The Martian Wave: 2014, plus all of our novels, zines, anthologies, and RPG products. The end of July marks the five year anniversary of the release of the Ephemeris Science Fiction Role Playing Game. To celebrate, we’re putting all of the Ephemeris products on sale for 30% off through our website. The Ephemeris Encyclopedia Galactica: Colonized Space is now available in paperback. This supplement lets you explore the sectors of space that are "controlled" by each of the six species. The Ephemeris Encyclopedia Galactica: Colonized Space is a combination of the first six volumes of the Ephemeris Encyclopedia Galactica. It looks at each sector of space that is controlled by one of the six species. An invaluable supplement for anyone playing the Ephemeris Science Fiction Role Playing Game, especially those that have been looking for campaign settings for their games. A useful tool for both players and game masters, this supplement will help elevate your Ephemeris game to the next level. Before ordering, please keep in mind that this supplement contains the same information that was released individually in the EEG for sectors 3, 8, 9, 10, 13, & 21. Over 600 pages of hardbound rules for the Ephemeris RPG, and we're talking full size 8 1/2 X 11...a must have for any Ephemeris game master or player. We've released print versions of two more Ephemeris titles. You can get The Ephemeris Omnibus 2013 at http://rpg.drivethrustuff.com/product/113551/The-Ephemeris-Omnibus-2013?manufacturers_id=2805 and you can get The Ephemeris Encyclopedia Galactica; Colonized Space at http://rpg.drivethrustuff.com/product/127376/The-Ephemeris-Encyclopedia-Galactica-Colonized-Space?manufacturers_id=2805. A new supplement in the Ephemeris Encyclopedia Galactica is now available. We're starting to look at "Near Space." These are systems that are close to the main systems of the six species, but actually aren't under their control. In many places, you'll find worlds that have been colonized by one of the six species, or you might find worlds that had been colonized by an ancient species, or you might find something even stranger. This supplement looks at three of the sectors of Near Space. Today I’m participating in a blog tour where authors discuss their writing process. My friend, the extremely talented David Lee Summers, posted last week. You can learn about his writing process here: http://dlsummers.wordpress.com. After spending a lot of time working on novels, I'm taking a bit of a break and going back to writing short stories. This is where I cut my teeth as a writer, and as much fun as I think novels are to write, I enjoy short stories even more. I think trying to condense a great deal of detail into a very small number of words is every bit as challenging as writing a novel, but in a very different way. I've also been spending a great deal of time writing supplements for the Ephemeris RPG, which is a very different kind of writing, but just as challenging and just as fun. While you can definitely see the influence of writers like Asimov and Heinlein on my work, I think my work tends to focus a lot more on the individual as opposed to the "big" idea. Much of my work centers around the idea of the individual oppressed by society, or technology. Although I often try to paint an optimistic picture of the future, much of my work is pessimistic. I also think I focus a lot more on dystopias than many other writers. I think the answer that "I have to" is a pretty good reason. I've been fascinated by science fiction since I was a very young boy. I first saw Star Wars when I was seven, and yesterday was probably the 50th time that I've watched it (or maybe it's more), and I've loved everything SF ever since. Science Fiction also gives me the opportunity to express some of my concerns about society in a way that isn't necessarily preachy. Authors have been using SF to talk about the ills of society for decades, and I'm just following their lead. Much of my writing is done in my head before I even sit down in front of a keyboard. Since I have three kids, ages 3-13, actual writing time can be difficult to come by, so I more or less have to write whenever I have time.. If I'm working on a hard SF piece, I will also spend a great deal of time researching the science I'm going to use because I want to make sure I get it right. Once I start writing, I'm not the revise as you go type. I tend to plow through a story until I get to the end. Once I'm done, I let it sit for a bit and then go back and do massive revisions. A lot of times my rough drafts are deficient in description, so I go back and add that in the second draft. Once that's done, I let it sit again for a while before I do a third draft. After that, I hope the story is done, and I move onto the next story I want to write. Ian Brazee-Cannon - Ian Brazee-Cannon is a writer, film maker, game designer, podcaster as well as a husband and father. His short stories have been published in The Fifth Di..., Wondrous Web Worlds, Forgotten Worlds, Tales of the Talisman and May-December Publications' anthology 'Say Goodnight to the Bad Guy'. Ian has been working with Nomadic Delirium Press on supplements for the Ephemeris RPG. He is one of the founders and regular co-hosts on the Amateur Skeptics podcast. Ian has also involved with Dangling Carrot Films, Running Riot Productions and Ijin Productions as a writer and director on their projects. It's a new t-shirt vendor that offers you the chance to express your opinion of some of the truly frustrating people in the world...http://www.cafepress.com/idiomsaboutidiots. I had just gotten Lex to sleep on Thursday night when I felt a really powerful sneeze coming on. I wanted to do my best to not wake her up, so I did everything I could to restrain it. Once I did sneeze, I felt my bad ribs pop and move around like crazy. Needless to say, I've been in almost debilitating pain ever since, and have not been getting much sleep. If I had to rate the pain, I'd call it a seven or an eight, and you have to keep in mind that I have a very high threshold for pain. I can't get comfortable unless I'm sitting up, and then it has to be on something soft like the couch...not the best way to sleep. This made us decide to do some research on possible corrections. One thing we found is that there are very few surgeons that will actually re-do the procedure I had on adults. And of course we also found that in general, insurance companies won't cover it, and the procedure runs $10,000-$30,000. We don't know if a complete re-do would be necessary, because we were having trouble finding surgeons who even had any idea of what they might be able to do for the pain, and the one we did find was a quack and a half. Once I'm insured again, we will renew the search. Also in our research we began to wonder if my procedure had been screwed up. Even all those years ago, it was typical for a surgeon to insert a bar to support the sternum, and given that I had the worst case my surgeon had ever seen, I'm forced to wonder why this bar wasn't inserted. Yes, it would have been another procedure two years later, but maybe that would have helped me avoid all the pain I'm in now. I'm sure no doctor will say that because they'd worry that I'd sue my surgeon, but he wasn't all that young at the time of the procedure, so I'm not even sure if he's still with us. For now, I just have to try to deal with the pain. The 800 mg of Ibuprofen every 4-6 hours just isn't doing the trick anymore. No matter what, this is an awful place to be, and so far we haven't found anyone that might be able to help me out of it. We are also working on releasing this as a paperback. More details as they are available. We got a letter from our health insurance notifying us that they aren't going to pay for Alexis' overnight stay after her surgery because they deemed it unnecessary. I'm not exactly sure what their criteria are for "necessary," but I think it's ridiculous that a health insurance company thinks they know more about health care than the actual doctors. From the beginning, it was expected that she would stay overnight. The only reason she wouldn't have is if they only had to remove the cyst, but the fact that they actually had to remove part of a bone from her neck made the overnight stay necessary in the eyes of our doctor. This is the kind of BS that needs to stop. When I was unsuccessfully trying to get treatment for my chronic pain, the health insurance company wanted to refuse a cat scan for me. I really love these guys. Based on the rambling letter they sent us, it sounds like they actually aren't going to screw us over, but instead they're going to screw the hospital over. And people wonder why health care is so expensive. We need a complete dismantling of the insurance industry, not stop gap fixes. I watched the new Cosmos series last night. I have to admit that being a huge fan of the original series, I was a bit skeptical about this one. After watching the first episode, I'd have to say that I'm not as skeptical as I was, but I'm also not completely sold on it either. I liked that they made it different enough from the first series that it didn't seem like a rehashing of that series. I also liked that they paid tribute to the original series, especially showing Carl Sagan's planner with the name Neil Tyson on one of the Saturdays...it was a nice way to show some continuity. Will this show be able to live up to what the original series did? It's hard to say. The original series had a huge impact on a lot of people, especially me. I was only ten at the time, and fascinated by science, so this hit me at the perfect time. That's a little hard for the new series to live up to. Thinking back to the first series, the first episode was a little slow, just like the new series...more of a tease for both than an actual episode. Suffice it to say that I will tune in next week, and hopefully this one will pull me in like the original did.